In German we have a saying which means “why wander around in the distance when good things lie nearby”. I live in Karlsruhe in southern Germany and I listen to a lot to music from all over the world, often excellent music, and I also try to go to concerts for which I have to travel quite far sometimes. On the other hand there are musicians like bassist Johannes Frisch and bands like Kammerflimmer Kollektief right around the corner. Johannes Frisch has worked as a composer and improviser in genres like experimental rock, free jazz and electro-acoustic music and has played with the crème de la crème of the improv scene – for example with Lol Coxhill, Maggie Nicols, Johannes Bauer, Le Quan Ninh, Paul Hubweber, Harald Kimmig, and Misha Feigin. He is also a member of the fabulous Kammerflimmer Kollektief, Mia Zabelka‘s trio and DFTh + HBW, a band with drummer Rudolf Theilmann, another Karlsruhe legend. Frisch is influenced by a lot of different music – from the Art Ensemble of Chicago and John Coltrane to György Ligeti, John Cage, Jimi Hendrix and John Zorn as well as world music in general. It is no surprise that his groups sound very differently. Often their music is completely improvised but when he plays with Kammerflimmer Kollektief (he started working with Thomas Weber’s band in 1999) there are notated and pre-recorded parts, too. Like many of his fellow musicians his art is dominated by the search of an individual sound and a personal style. And once in a while he simply likes to rock. He is an artist that definitely deserves more attention and over this weekend we will have a look at some of his recent releases. I don’t know if there is a direct connection between the law and free improvisation, between the compliance of rules and the constant expansion of a certain system, maybe it is mere chance. For some reason there are a few people I know that have to do with courts who have a connection with free jazz – my friend Christoph is a judge, Colin is a lawyer, Dan works as a court clerk. And Ralf Wehowsky, the man on electronics and so-called sound transformations on this album, is also a lawyer. His connection with Johannes Frisch goes back to the 1980s and Which Head You’re Dancing In is their third album (in 2005 they released Tränende Würger which was followed by Unwahrscheinlichkeiten in 2010). The most fascinating aspect about their music is the clash between Frisch’s acoustic (albeit extended) bass work and Wehowsky’s bizarre and wizard-like sounds that remind of Lasse Marhaug’s noise concepts. Frisch’s approach is more interested in the modifications of his instrument, he presents the tone colors of the bass in a natural, varied and authentic way – which leads to the crude effect that they also sound alienated in Wehowsky’s storm of steel, e.g. in “Crisis in Space”, a piece Sun Ra would have liked and which could work as a freaky soundtrack for John Carpenter’s “Dark Star”. 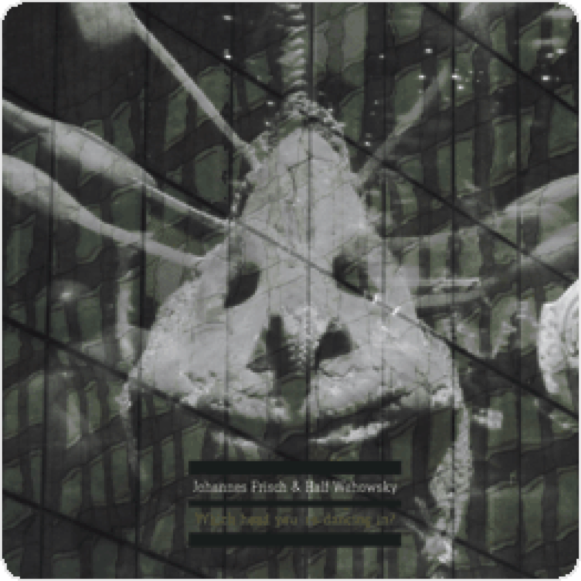 In general Wehowsky’s notion of music seems to be less textual but rather percussive, his electronics are like small detonations, a hail of bullets attacking Frisch’s bass lines, the music even transgresses borders to drum’n’bass (“Skies of Guantanamo”) and industrial music. While the bass delivers the textures, the electronics set the course – actually just the opposite one might expect from such a line up. The individual tracks, which have weird titles like “Acid Breakdown” or “Which Cloud You Are Coming From” (and they sound like that), are often fragmentary, they remind of work-in-progress, e.g. “Stutter Train Stoppage” comes along like someone searching for a radio station and “Theme for a Skyscraper” tries to capture the noises such buildings make when they are swinging to and fro. Especially on this track the music sounds distant, as if sound snippets were hurrying through an aural picture. All in all this is very challenging music, somewhere between a playground for electronica and a trip to the outskirts of the human mind. When I asked Frisch’s Kammerflimmer Kollektief band member Thomas Weber what he thinks about this album he told me that he asked Frisch what kind of drugs they had taken while recording this music. Frisch answered quick and easy: “None. Just green tea.” Then, on the other hand, I don’t know what mind-expanding ingredients there are in green tea. You can listen to excerpts of the album and buy it here. Johannes Frisch met Mia Zabelka in the 1980s when she played with his friend Helmut Bieler-Wendt. After having lost sight of each other, they met again when Kammerflimmer Kollektief played Austria and when Zabelka decided to start a new trio. Frisch’s work with the Austrian violinist is completely different to his other projects. Zabelka is interested in the exploration of the relationship between body, gesture, sound and space – an art form that tries to combine new media, literature and sound art and what she calls “automatic playing”. Compared to Which Head You’re Dancing In the approach on this album is less physical and spontaneous but more intellectual and diversified. However, the music also rocks – maybe because electronics play an important role for these tracks as well. However, the groove is much more in the focus than on his collaboration with Wehowsky. Frisch also plays electric bass and shows that he can fill a more traditional role with his playing, too, which – in combination with Pavel Fajt’s straight drumming – makes the music much more accessible than on Which Head You’re Dancing In. “Backyard Funk”, the first track on Weird Tales and Elegant Motion, starts like a Miles Davis fusion album from the late 1970s and Zabelka’s violin sounds like an electric guitar, then the music takes turns to weird jazz/rock experiments (“Back to Start”) and sound installations (“Wind – Rewind” with Fajt on tablas), before it delves into meditative sound worlds (“Live in Klang.Haus”) presenting Zabelka on vocals, which gives the track a mysterious and spooky twist. The album’s climax is the almost 10-minute minimal meditation “The Order of Things” with its deep and magic danceability. Of course there are exceptions to the rule like “Uwaga – Serious Game”, an atonal and edgy color spot or the mysterious “Djinn”, with Zabelka on vocals again, that reminds of Krzystof Penderecki’s music for Stanley Kubrick’s “The Shining” interspersed with weird prayer mantras. Weird Tales and Elegant Motion is a wide palette of different styles consisting of avant-garde soundscapes, free jazz, experimental electronics and steaming grooves. Very interesting. Colin, I do hope you don't improvise while judging people!